What is Agile? This is Agile Made Simple. In its simplest form, Agile is the act of taking one bite at a time. In traditional methods of development and marketing, everything is created in one swoop - eating the elephant in one bite. Software and marketing projects may be different in content but are similar in size and complexity. Each project holds countless moving and interconnected parts that all work toward achieving one result. We achieve this goal by using a few core guidelines in the Agile manifestos. An Agile-functioning team is fast-paced and highly collaborative. Each team member is able to immerse themselves into a client’s business and processes to fully understand and address key issues. This makes clients more confident in the project because as stakeholders’ priorities change the client has the flexibility to change development directions to create best-fit solutions. For example, every day, Client X’s employees were spending countless hours navigating spreadsheets and communication channels in order to process thousands of confidential documents for each customer. So, like most projects, Client X came to us with a grand solution in mind. They envisioned a system that did it all, automating the entire process with a simple click of a button. Thankfully, our Agile team knew exactly what to do and which questions to ask. The driving question was, “What is the most valuable solution we can quickly get into the client’s hands so that they can begin using it?” In the world of Agile, this is called the Minimum Viable Product (MVP). Rather than setting out on a potentially multi-year, extremely expensive project to accomplish the grand solution in its entirety, we started with the most valuable, most cost-effective piece. In this case, the biggest pain point for Client X was manual documentation review and organization. That pain point solution became our MVP. From the very beginning, the client was less fearful of the investment because they are making smaller investments for immediate and valuable results. The client also knew that they will have full visibility and control over the project every step of the way. Every two weeks, we showed Client X progress and opened the floor for feedback. With the MVP as the goal, the team began “taking the first bite,” a.k.a. working using our iterative process. As the team completed each iteration, they were able to hear feedback from the client and constantly shape the product into its highest value version at every step. Even if updates or changes were needed in Iteration 5 or 11, our team was able to react and continually build exactly what Client X needed for MVP success. At the completion of the project, the team was less stressed about meeting a deadline and more confident in the product they delivered because the project had been revised and tested every step of the way. In just a short time span, we were able to deliver a fully functional product to Client X to begin implementing into everyday workflows. As a result, Client X decreased processing time by 70% for each of its customers in the first week and solved its biggest pain point and hindrance to growth. By the end of the project, they had a high-value product that took less time and less money than traditional development methods. With a more agile and scalable workflow, Client X was ready to start work on Phase 2 within the next month. 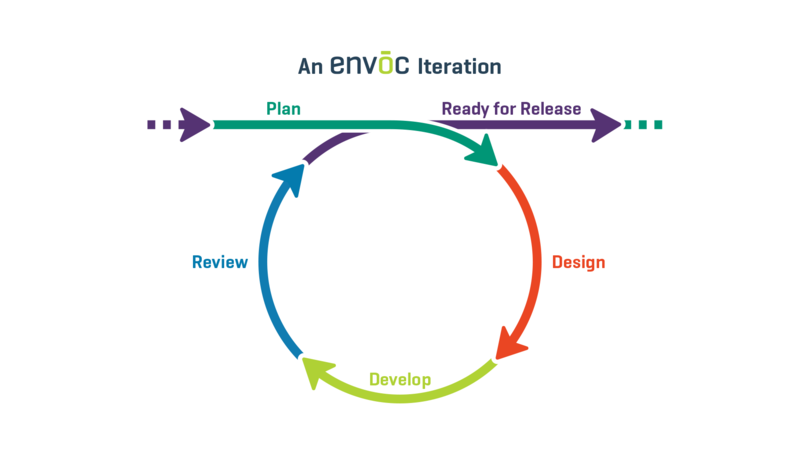 Agile is Envoc’s proven method of success. If you would like to talk with our team of technical counselors to learn how Agile could work for your mobile app, custom software or digital marketing goals, we’re here to help. All you have to do is start the conversation.